There are numerous humidification products available in the market, but they do not all provide the same high level of functionality, effectiveness and ease of use. The diagram below outlines some of the key features of humidity control products, and the differences between each of them. The chart clearly demonstrates Boveda’s leading position in the market. Boveda – Boveda provides effective two-way humidity control. Simply place the humidity pack in your container, and it will regulate the humidity to a consistent level until the pack needs replaced. Crystals – Crystals provide one-way humidity control using the absorption of moisture. The crystals are placed in a container, and continue to absorb water from the air until they are saturated. Gels – Gels are silicon-based desiccates which adsorb and hold water. When placed in a storage container, the water molecules in the surrounding environment are drawn to the surface of the gel. However, like crystals, gels only provide one-way humidity control. 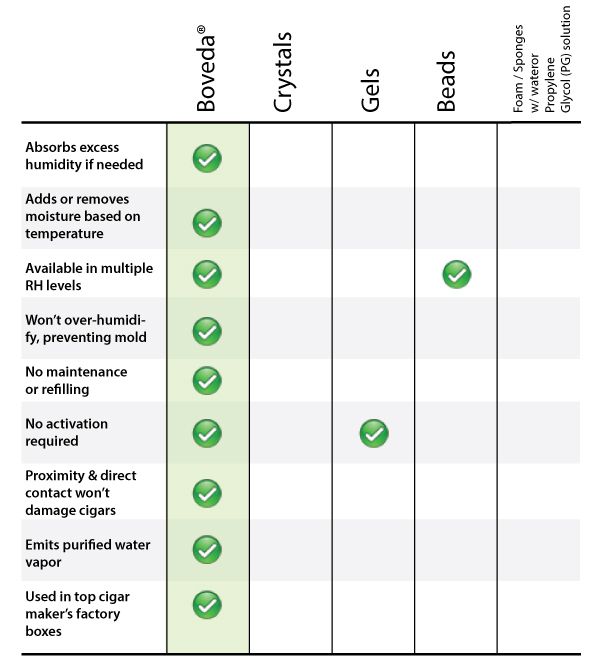 Beads – Like Boveda, beads are pre-programmed to reach a specific relative humidity level, and moisture can be both absorbed and given off. However, once saturated with water, the beads must be dried out before you use them again.